Google has officially inserted itself into the gaming eco-system with its announcement of the new Stadia game streaming device, but what is it and what exactly can it do? The Stadia is not a console; there is no physical unit that you would download files to, instead it utilises “cloud based gaming” to connect you to vast data centres whenever you open it up. With no console you can instead run the Stadia application essentially anywhere where YouTube is available. This includes Smart TVs, laptops, tablets, mobile phones, desktop PCs or streamed from the specific Stadia Controller into a Chromecast in an older TV. This essentially makes Stadia a “service” rather than a piece of kit with the only physical unit you get being the Stadia Controller itself. Having said that you don’t need the the specific controller to run the service, and users are able to use any USB controllers (according to Google) with devices that have a USB input or even Bluetooth controllers. 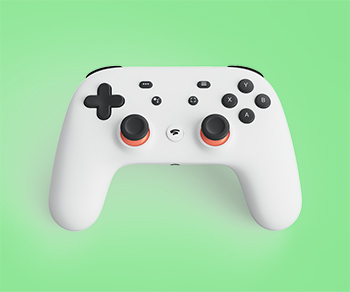 Google have however stated that to get the full list of functionalities and to get the most out of it, then you should be using the proprietary Stadia Controller. With the controller itself it looks like what you’d expect a modern controller to look like albeit a little bit more minimalist then the likes of Sony or Microsoft. It comes with everything you’d expect a controller to have button-wise but it also adds a share function for live sharing your game as you play and a voice command function that utilises Google Assistant Technology. It doesn’t do anything remarkably new but when that comes to controllers, it looks to be a better way to go. In regards to streaming, Google have stated that Stadia is going to be a service like YouTube or Netflix where you can play games in 4K at 60fps, with plans for 8K in the future. Supposedly the time between you choosing what you want to play and playing it will be around 5 seconds which, if accurate, is going to be pretty spectacular, also allowing you to seamlessly transition from watching a stream of someone playing to playing yourself. As well as this Google has stated that if you’re watching someone stream you can join them at the touch of a button but whether this works remains to be seen. It seems so far that the Stadia looks to bridge the gap between streaming and playing games and if it works could change how a lot of people play games. Tech-wise the Stadia will use a custom 2.7 GHz hyper-threaded x86 CPU with AVX2 SIMD and 9.5MB L2+L3 cache, custom AMD GPU with HBM2 memory and 56 compute units (capable of 10.7 teraflops), 16GB of RAM with up to 484GB/s of performance and SSD cloud storage. Apparently this hardware can also be stacked meaning that any future games that push these specs could still be catered to. As of right now the specs of this are more than any versions of modern consoles but that may change if any one releases a new higher powered next gen unit. At the time of writing there’s no exact release date but it has been stated that it will be coming out in 2019, and there’s also no idea of how much it will cost and what kind of pricing structure it will use. If the Google Stadia is an affordable way of streaming games with a low latency for a reasonable price then we could be seeing a new way of gaming becoming the mainstream, but at the moment the physical medium of gaming is safe, and I imagine even if the Stadia is a roaring success the likes of Sony, Nintendo and Microsoft won’t stop with physical consoles and physical games any time soon.